Last week I wrote about picking specific chunks of the workflow in your organization to focus your inclusion efforts on as an alternative to the easily overwhelming goal of culture change. I then wrote about and shared some ideas of how we might do that with meetings. Today I am going to get even more specific. The work of inclusion is largely about removing barriers to participation and belonging, and meetings frequently have barriers (intentional or unintentional) to full participation and belonging. When a group is trying to make a decision, but it is unclear how the decision is going to be made, it can easily appear safer to not participate. When people do not know whether or not it is safe to disagree with someone carrying a bigger title, it easily appears safer to not fully participate. These are just two examples, but they happen all the time and they limit the potential of the group. Another dynamic frequent to groups is interruptions. While too much interrupting can be a problem, it becomes a different sort of problem with different consequences when specific people or specific groups are interrupted disproportionately. Several studies, old and new, have shown that interrupting has some gender dynamics attached. 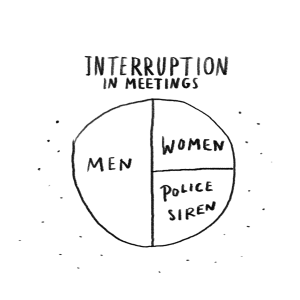 Men do more interrupting than women, and both are more likely to interrupt women than they are men. This shows up at all levels, including among Supreme Court justices and presidential candidates. This is a wonderful opportunity for us, as this dynamic clearly makes it more difficult for women to fully participate in these conversations, making it harder for the group (and the organization) to fully benefit from all the information and from all the perspectives on the payroll. And it is fairly easy to fix. The fix is not likely to be found in telling male employees to stop interrupting women so much. Most of the men doing the interrupting are not aware of it; this is frequently one of the ways in which our implicit biases show up. The remaining interrupters will likely find a way to justify or minimize their behavior. We fix it by designing for it. Meetings, especially standing meetings, should have ground rules. I actually prefer “agreements,” to “ground rules,” but you do you. These agreements, if we are willing and able to hold ourselves and each other accountable to them, are incredibly powerful tools for informing the ways in which we interact with each other. Add “no interruptions” to your agreements. And then decide how to monitor it. When I am adding a new agreement or a new practice to a team, I usually assign someone ownership for that agreement in the beginning. Assign someone the role of interruption cop, and task them with intervening every single time it happens. If someone does it a lot, make sure they get some coaching. This may seem like a small, specific thing, but it is tangible, with real consequences and real solutions — and this is something that reverberates beyond meetings. Removing the disparity in interruptions and reducing overall interruptions have real value to your organization, can make for a more inclusive employee experience for many, and lead to true culture change. You change culture by changing behavior, and this is an opportunity for us to focus on a specific behavior, thereby creating real change.